Click on Member Log In and enter your User Name (4 digits) and Password (6 digits). You will then be on “Your Home Page”. Click on “Member Details” on the left. You will then see your details and you can change the mobile number. Once you have changed them, click on “Submit” at the bottom of the page. Click on Member Log In and enter your User Name (4 digits) and Password (6 digits). You will then be on “Your Home Page”. Click on “Member Details” on the left. You will then see your details and you can change the email address. Once you have changed them, click on “Submit” at the bottom of the page. If there are two incorrect attempts to log in to an account it is automatically locked for obvious security reasons. It is a simple matter for us to unlock the account - see next question. Send an email to info@highflyers.tips and ask for your account to be unlocked. How do I get a reminder of my Password? Click on Member Log In. Enter Your User Name (4 digits) at the bottom of the Page there is a button - “Password Reminder” Click on this and an email will be sent to the email address on your account with your password. How do I get a reminder of my User Name and Password? Send an email to info@highflyers.tips asking to be reminded of your User name and password. You must send this email from the email address we have on file or include your mobile number so we can be sure we are sending this to the right person. I am going to be away and don’t want emails for a while - what should I do? You can contact us by email at info@highflyers.tips giving us the date you are going and the date you are returning and we can make your account dormant during this period - avoids filling your inboxes with unwanted emails. What time is the betting information sent out? The first betting information message is usually sent out between 08:30 and 10:00 but there can be exceptions where it will be later. If you are unsure about whether the bets are ready you can go to our website and if the flashing box is not displayed on the left hand side of the page, you will know the bets are not yet ready. What time is the late news sent out? The late news can be sent out at any time during racing - and that includes evening racing. However, it is usually sent during the morning. I want to buy a subscription but cannot use the Internet - how? How does a subscription operate? With a subscription you receive the betting information automatically every day as soon as it is ready. The subscription operates for a specific period and rates are shown at on the website - CLICK HERE for full details of subscriptions. Click on the "Buy a Subscription" button on your home page after logging in to your account. .
How do I listen to the Audio service? 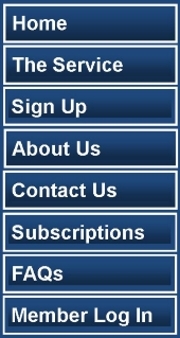 Log in to our website with your user name and password and if you are a current subscriber you will see a button "View Betting Info" Then click on “Click to Listen”. An audio file will then be downloaded to your computer and played automatically. The audio sound file is also attached to the best bets and late news emails. In Member Preferences you can select the format for the Audio File - either .mp3 or .wav If you do not want the audio file attached to emauls then select "No Attachment"
Do you proof your betting information? We do not proof to the Racing Post or similar as there is now no requirement so to do. This concept of proofing originated from a period in the late 1980s and early 1990s when there were many Horse Race Tipping Services being provided on Premium Rate Telephone Numbers. As recordings were not kept (and they would not have been easy to manage anyway in those days), Tipsters could say what they liked about past results in their promotional activities as there was no verifiable record of what tips were given. Proofing was introduced by the Premium Rate Telephone Service regulator ICSTIS (appointed by OfTel now PhonePay Plus and Oftel is now OfCom) to control this problem - our Jon Carter was personally involved in developing the code of practice whilst a Director of that Organisation. Some while ago this requirement was removed from the Code of Practice and is no longer applicable. It is worth noting that all our betting information is sent out in written form - as emails and we retain copies of all - so information is verifiable should the need arise. What does an ew (each way) bet mean? An each way bet is actually two bets - a win bet and a place bet. If we give an ew bet of, say, 2 pts, this means 2 points to win and 2 points to place - a total of four points staked. How do I know if the betting information is ready? If you are a subscriber the betting information is sent to you automatically as soon as it is ready. If you want to check whether the bets are ready, go to the website and on the home page you will see a flashing box on the left side saying bets are ready, if this box is not showing the bets have not been sent out. What Type of bets do you advise? 2. Each Way Bet. An Each way bet is two bets , one to win and one to place. 3. Straight Forecast. A Straight Forecast is one bet with Horse A to beat Horse B in first and second place. 4. Reverse Forecast. A reverse Forecast is two bets: Horse A to beat Horse B in first and second places and Horse B to beat Horse A in first and second places. How much should I bet per point? The amount you bet is entirely up to you and you should never bet more than you can afford to lose. We would suggest that you have as a betting bank 300 points available to you. Should I vary my Stakes? We do not recommend that you vary the amount you bet per point. How many bets are there each day? The number of bets per day will vary. On very rare occasions there are no bets and on some days there may be 6 or 7. The overall average number of bets since we started is around 5 a day. Should I bet on all selections? The answer is YES! Bear in mind that we are focussed on making a profit each day and that takes into account all of the selections for that day and the staking plans. How do I get best value with my bets? 1. Try and get on as early as possible after the betting information is sent out . 2. Use www.oddschecker.com to find the best odds available. 3. Have accounts with as many bookmakers as possible and, also where possible, use those who offer a "Best Price Guarantee" so that, should the price drift and the SP is higher than the price taken earlier, you will benefit from the best odds. We fully appreciate that personal circumstances may make following the above difficult, but doing these three things can make all the difference between winning and losing! Who should I bet with? In addition to the answer in the previous question you may wish to consider another factor. The nature of our service, as described on our home page, is all about finding BIG priced winners. Our bets include forecasts where the returns can be massive. Paying massive returns could be a problem for small independent bookmakers but unlikely to be so for national companies where prompt payment is much more certain.